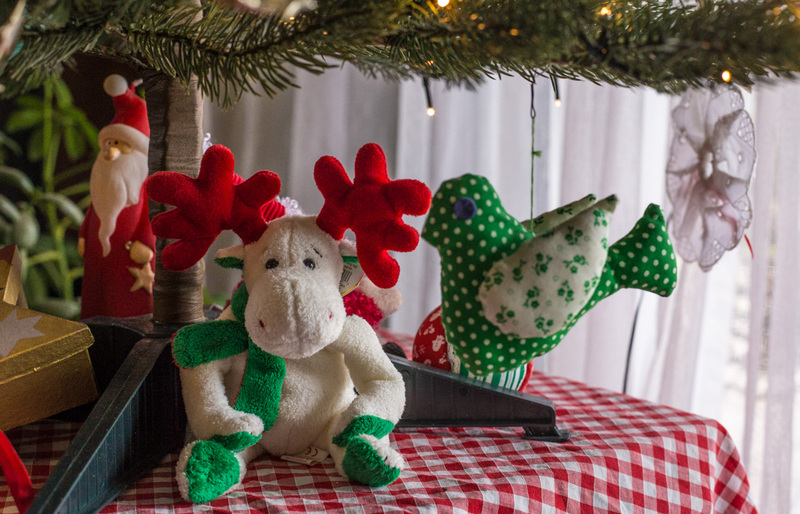 Our little stuffed Christmas moose (his label says that his name is Moosletoe) is hanging out under the tree this year. Today's his last day out before he goes into hibernation for another year, along with all the other holiday decorations. 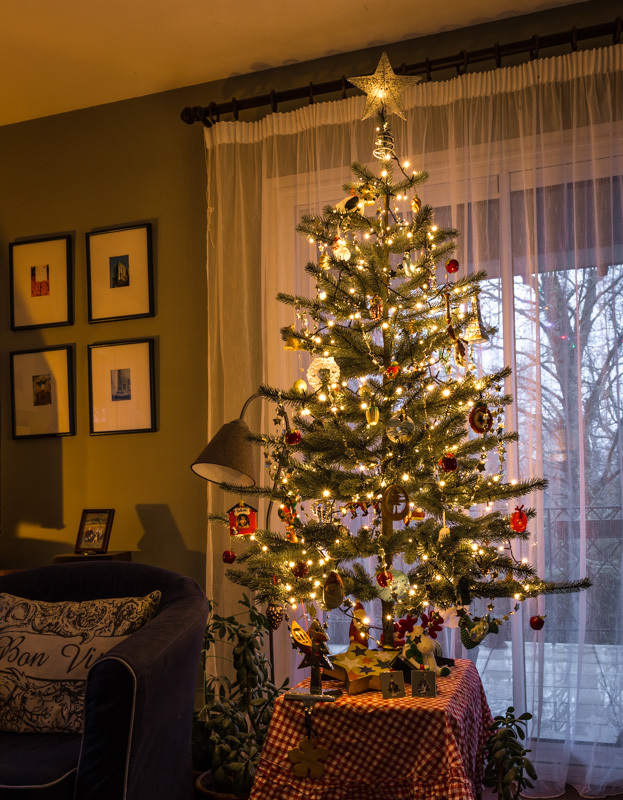 My tradition is to put Christmas away on New Year's Day. I think that started because NYD was often the last day off before going back to work. And, by NYD, a cut tree is dropping needles like crazy. The Santa candle was a gift, the stuffed bird and fabric wreath ornaments were made by my stepmother, many, many years ago. I don't have the cut tree problem any more, but I still want things put away on the first of the year. Fresh start, and all that. More likely: old habits die hard. 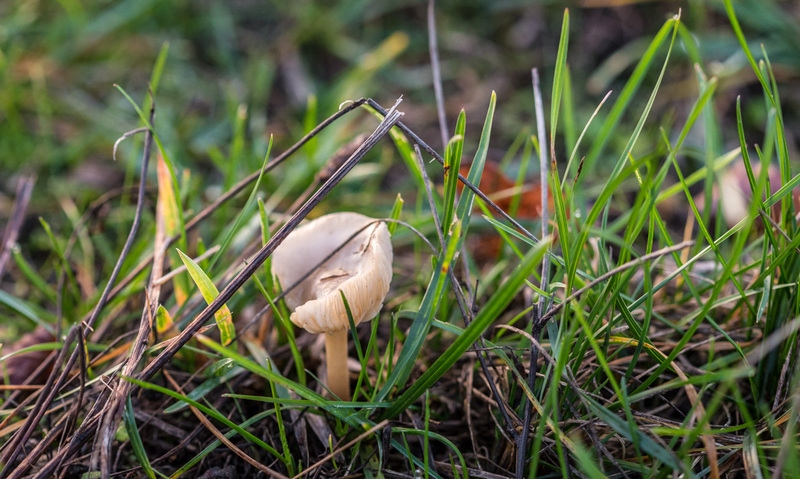 Just a little wild mushroom in the grass. They liked the damp, warm days we had in the late fall and I noticed many different varieties sprouting in all the usual places. The grasses around us have gone from summer brown to winter green. And the winter wheat has sprouted in the fields. We've started gaining minutes of daylight, although it's not at all perceptible yet. But in a couple of weeks we should start noticing it staying light a little later, and getting lighter a little earlier in the morning. Unless it's cloudy. Saturday was overcast and it felt dark all day. The holiday lights make things a little more bright, but they'll be coming down on New Year's Day. This is cerfeuil (chervil) growing in a little bed on the western side of the house. I've been planting chervil seeds here for a couple of years now with mixed results. The spring crop has been good, and we use some, but then it goes to seed quickly and doesn't come back. It's a delicate herb and doesn't like hot weather. Sprouts of chervil coming up among fall's leaf litter. Well, last year the seed crop was abundant, and this fall I noticed these seedlings coming up all on their own. They're still there, so I'm hopeful that we'll have a good early crop over the next months. Chervil is a tasty herb with a light anise taste. It's good in salads and with chicken dishes, and would probably be a great addition to some Asian dishes, too. I'm hopeful that it's established itself and will self-perpetuate in this bed. Mistletoe is a widespread parasite in our part of France. It's certainly present in our yard, seriously infecting two of our apple trees. Both of them are on their last legs, with more gui (mistletoe) than actual leaves in their branches. A couple of mistletoe berries fell from the plant above and were caught in the crotch of this tree. Mistletoe produces these white berries, and birds feed on them. When the bird poops, the seeds are often deposited on another branch and take root. Mistletoe thrives in apple, hawthorn, and poplar trees in our area. It's nearly impossible to get rid of, unless caught very early. In the spring, when all the grape vine pruning has been done, the growers will fasten the single remaining cane of each vine to the guide wires. They normally use metal fasteners that are applied with an electric stapler-like tool. But, here and there, you see some string. Whatever was tied with this piece of string is gone now. 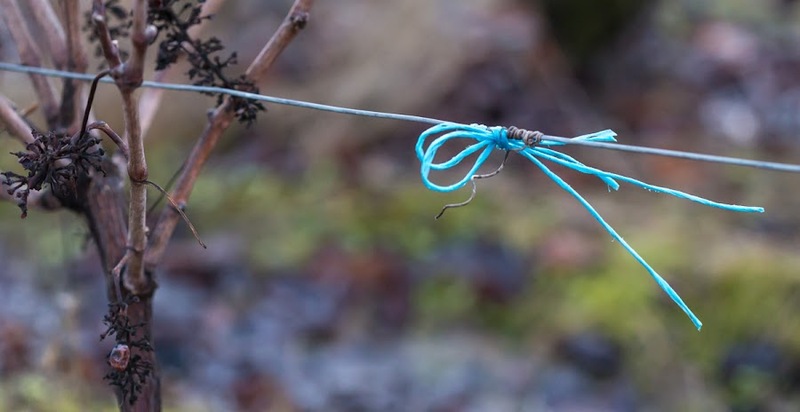 I'm thinking that the string is used during the growing season to tie up a wayward stem that didn't get fastened in the early spring. It's just a guess. I haven't made one of these in many years. The bûche (yule log) is a traditional French Christmas dessert. It's a jelly roll/sponge cake, usually filled and frosted with chocolate buttercream, made to resemble a log. 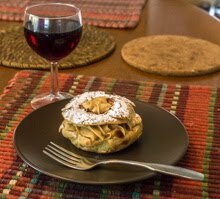 The bûches from a supermarket or bakery are much less rustic looking than mine and often pretty fancy, and they come in a variety of flavors. My bûche de Noël, before we ate some. This one is pretty simple, and kind of a mess, but it was tasty. I cut off one of the ends and stuck it on top to look like a branch, something that is typically done. The frosting was applied with a brush so that it looks like bark. I also sprinkled powdered sugar on top to suggest snow. Many recipes say to make little mushrooms with meringue, or use colorful marzipan to make leaves or other decorative shapes. Sometimes little candy (or plastic) figurines of Santa and reindeer are placed on top. The possibilities are endless! Well, here we are. Puppy Claus has come and gone and left tasty morsels for dogs and kitty cats. And for us. We shall be enjoying a roast beast with all the trimmings. 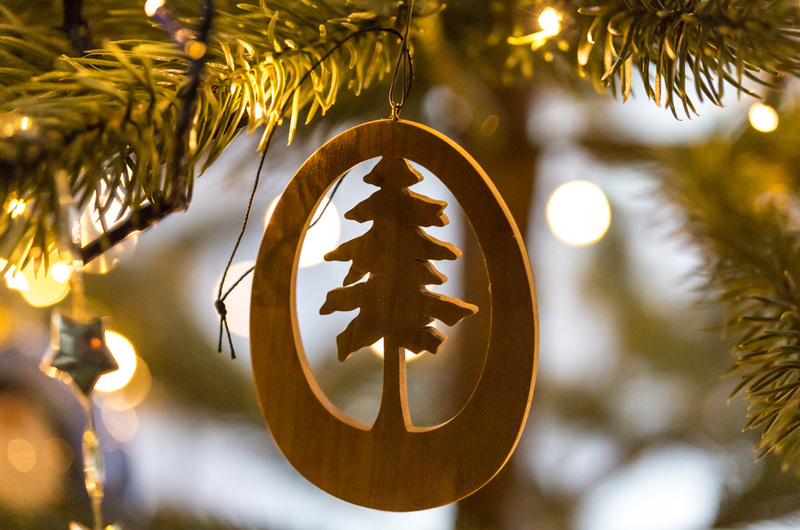 A favorite wooden tree ornament. Here's hoping that however you celebrate the end of the year, that you can do it in style with those you love. The old joke: It's not Christmas, and stop calling me Eve. Today we'll be making our annual fondue Suisse, a cheese fondue, for lunch. Three kinds of cheese from the region around the France/Switzerland border go into the dish, with some white wine. Then we dunk chunks of bread and apple into it. Yum. 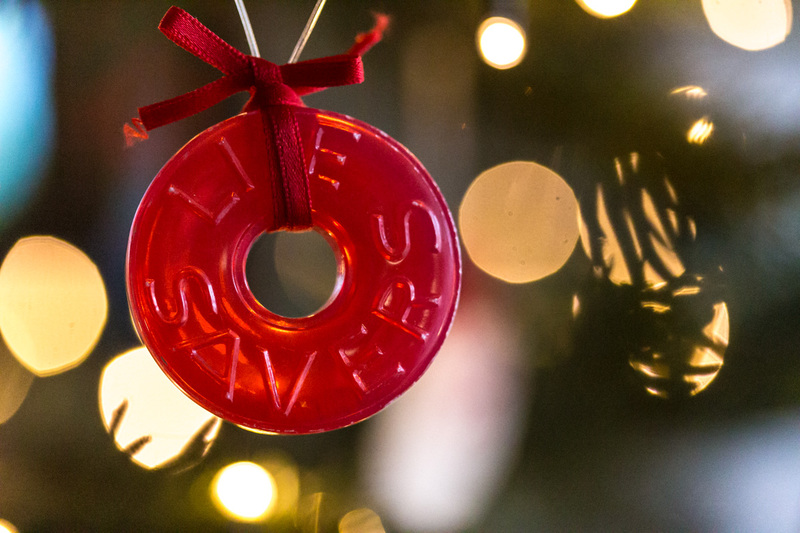 A Life Savers tree ornament. I also have a green one. It's nice to have traditions, rituals, to help mark the time. Traditions need not be religious to have significance in our lives. French people have their big holiday meal on Christmas Eve, and it lasts late into the night. We hold to our American tradition, which is to have the big meal on Christmas Day. Neither one of us likes to eat a huge meal just before bedtime. One of the grape growers with parcels out behind our house has been using broken terra cotta roof tiles to fill deep ruts in the ground at the end of his vine rows. The ruts are made by tractors and harvesters in the space between the dirt road and where the vines rows begin. The ground gets saturated with rain and becomes very soft and muddy. Broken tiles in the vineyard. The broken tiles give the tractors more traction as they enter the vine rows. The tractors' weight helps to break up tiles so that they become part of the soil and further stabilize it, at least for a season or two. Some of the tiles pictured above are stamped "Perrusson." That's the name of a town not far south of us near the city of Loches. 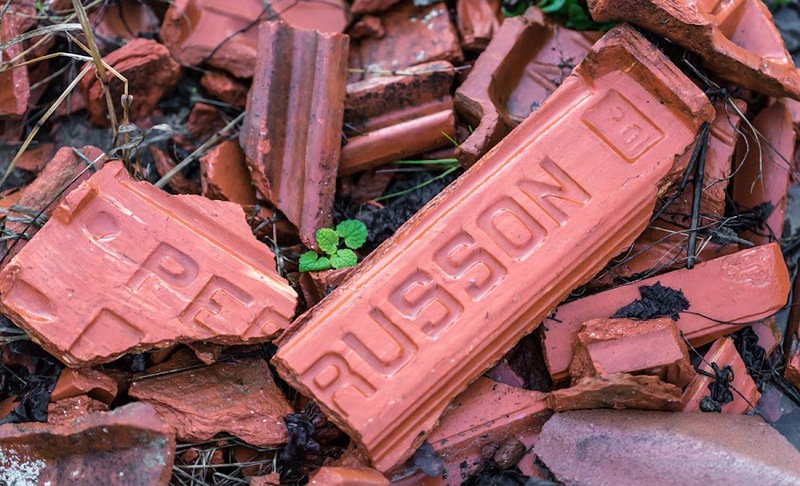 But there is also a historical tuilerie (tile factory) named Perrusson in Burgundy, so I'm thinking these tiles probably came from there. 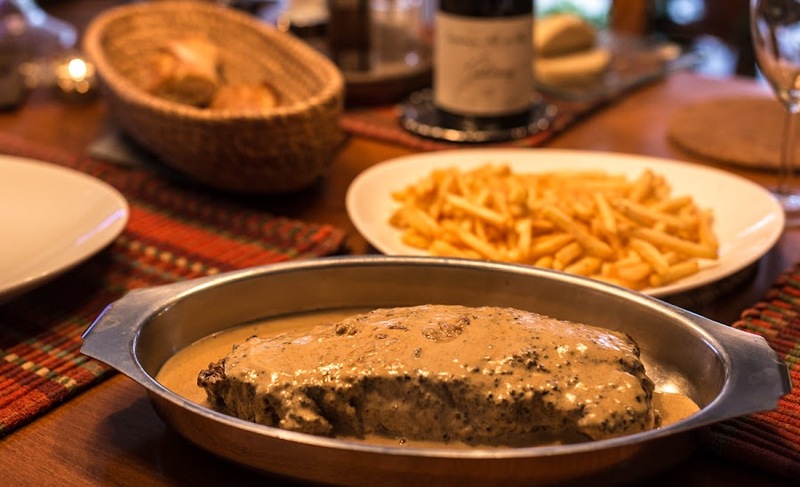 As we do every year on my birthday, we made steak au poivre and French fries for lunch on Friday. 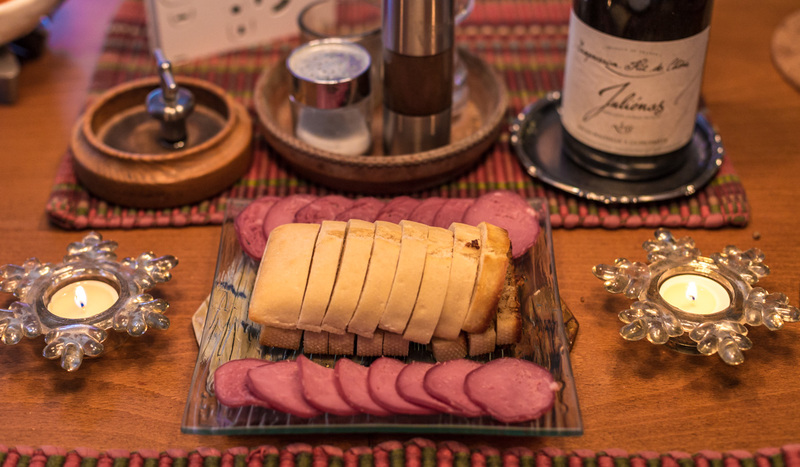 We started with an appetizer of préfou, a garlic bread specialty of the Vendée region where we stayed back in October, served with sliced smoked filet mignon of pork. I opened a bottle of bubbly to go with it. This year's steak was a thick slice of faux-filet (sirloin), smothered in cracked pepper, then seared in a pan on top of the stove. We both like the meat to be relatively rare, so it doesn't take long before it's removed from the pan and covered to rest. The préfou is basically a loaf of garlic bread that gets heated up in the oven before eating. 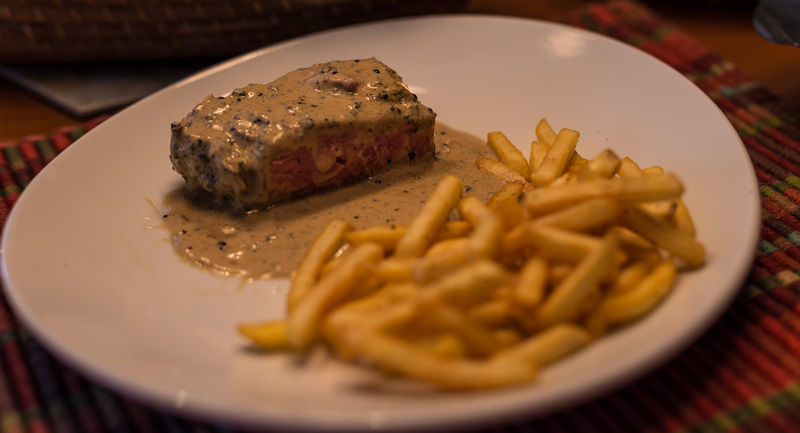 The sauce is made by adding cognac, or armagnac in this case, and cream to the pan after the steak comes out. When that's ready, the steak goes back into the sauce to be served. I made a batch of fries to serve along side and, voilà !, it's lunch. After the steak, we ate a green salad with hearts of palm. Faux-filet before the pepper goes on. 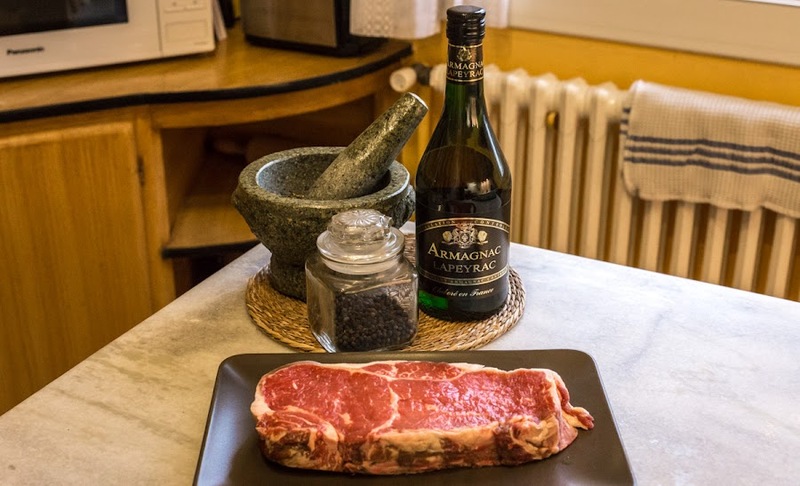 The steak marinates for an hour or two in a coating of freshly cracked black pepper. The wine was a Juliénas that we brought back from Beaujolais last spring. Everything was delicious, as usual. For dessert, we finished an applesauce cake that I had made earlier in the week. There was some steak left over which will make a nice snack over the weekend. So, now we turn our attention to Christmas Eve and Christmas Day meals. The first will be our traditional cheese fondue on Monday. Ken's going into the market this morning to pick up the guinea fowl capon that we ordered for Christmas Day. More about all of that later. My first helping. I had two. Today is the winter solstice. That means that the earth's northern hemisphere has reached its maximum tilt away from the sun. The days will stop getting shorter and, not long from now, will start getting longer again. Phew! There are still grapes in certain vineyard parcels. 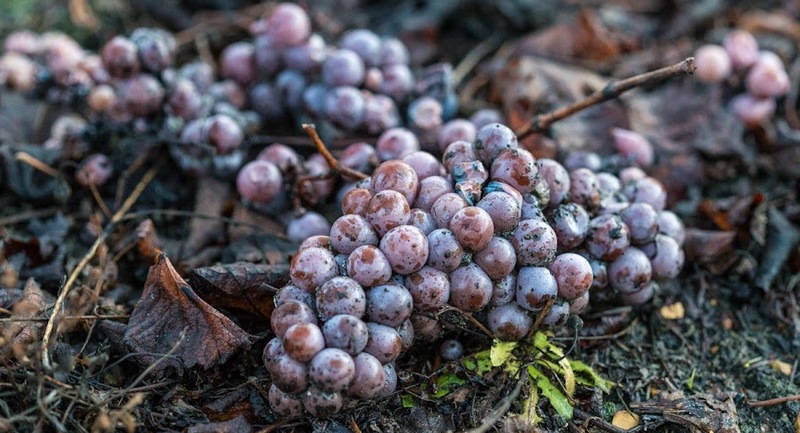 These are on the ground, but all around them there are grapes still hanging from the vines. Weird. The weather is not great. We're having a wind storm with rain that will last through the day. Yuck. But it's not cold. In fact, it's unseasonably* warm. This morning's low is around 10ºC (about 50ºF) and the high is expected to get up close to 15ºC (about 60ºF). 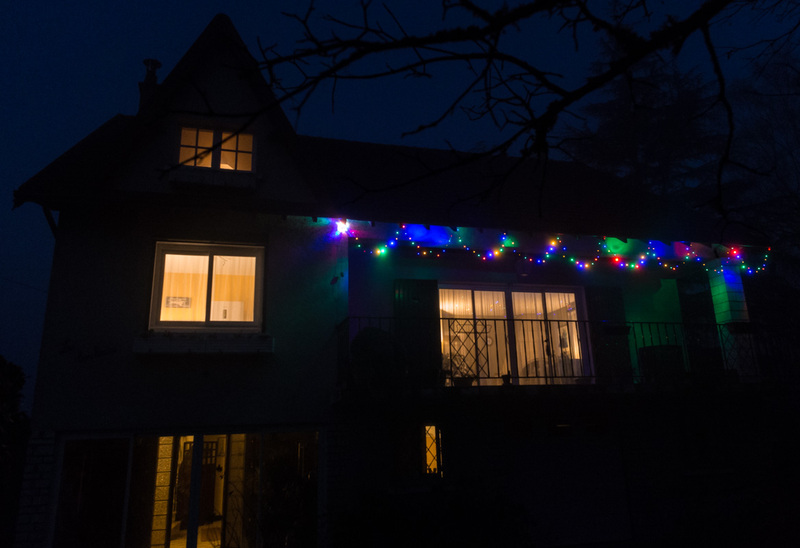 The French have an expression for just such an occasion: Noël au balcon, pâques aux tisons, which means "Christmas on the balcony, Easter in front of the fire." We shall see. Last October, I posted a photo of this tree out in the vineyard. The trunk was covered with suckers, those shoots of a plant that sprout around the lower stem. Since then, the grower that owns the adjacent vineyard parcel has trimmed the suckers away. The tree looks much better now. Tasha is out ahead of me on a recent morning walk through the vineyards. Most traces of fall foliage are gone. The vines are brown, but the grass has turned green again. Winter will arrive on Friday. Astronomical winter, that is. I understand we'll also have a full moon and a meteor shower along with the solstice. Only three months until spring! We've had a few foggy days lately. On those days, the air is crystal clear before sunrise, with stars brilliant in the early morning sky. Once the sun peeks above the horizon, fog forms and thickens. It's ground fog that looks like pea soup as you look horizontally. But often, if you look directly up above your head, you can see blue sky and high clouds through the fog. Our hamlet seen, or not seen, from the vineyard on a recent foggy morning. Sometimes the fog burns off by mid-day and the sun comes out. Other times, the fog persists and the day stays gray. Those are the inversion days, when a layer of warm air forms above the ground layer of cool air, trapping the fog on the ground. The air is still, there is no wind and almost no sound, a contrast to the wind-driven fog we knew so well in San Francisco. 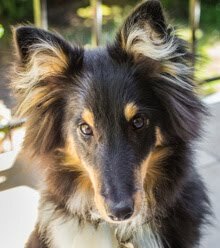 What is it with sheepdogs? You might remember that Callie, a border collie, would pick up grape vine trunks in the vineyard and bring them back home. I'm still burning them in the wood stove. Tasha has developed this habit, too, but in miniature. She finds small grape sticks and carries them around for a while. Then she drops them. She doesn't bring them home. Yet. Tasha dropped her stick on the road and posed when I pointed the camera at her. It doesn't help that I encourage her whenever she finds a "stick" to carry around for a while. 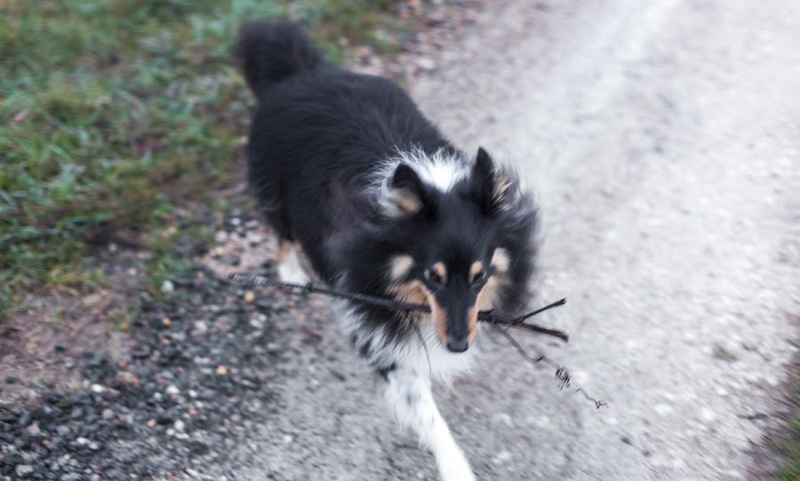 In fact, whenever she starts to jump on me (with her wet paws) I ask her to find a "stick" and away she goes. So I said, "Tasha, get your stick!" She picked it up and ran toward me. Always in motion, this one is. These are called stalactites de glace (ice stalactites) in French. 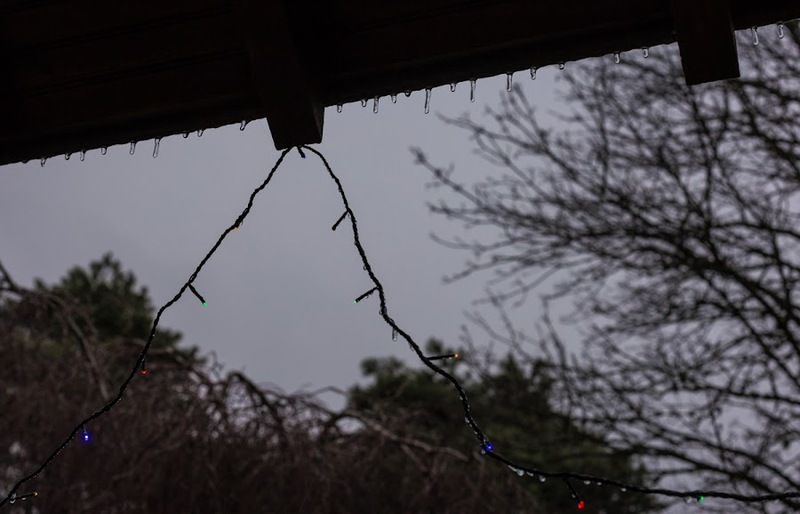 They started forming on our roof line last Saturday when a rain system moved in after a couple of days of below-zero temperatures. They never got any bigger than this, though, because the rain brought warmer air in and everything that had frozen quickly melted. We seem to be back into a more normal weather pattern now for this time year. That is a succession of relatively warm fronts off the Atlantic and, in between, clear nights and foggy days. I put the tree up on Saturday, as planned. The weather outside was frightful (just a little freezing rain, then real rain, and no snow), but the fire was so delightful. I played holiday tunes and sipped wine while I decorated. Fortunately, neither Tasha nor Bert is interested in the tree. White lights inside, colored lights outside this year. Next year, switch! I think that this is the sixth year for this artificial tree from Ikea. We got our money's worth, that's for sure. The price for real trees is, well, unreal. I was remembering holiday trees from the years before we moved to France. They were big floor-to-ceiling cut trees, usually. I used to string popcorn and cranberries to hang on the tree. Where did I get the time? Now I have the time, but I don't think I have the patience to string popcorn these days. I do have several strands of wooden cranberries that I found at Crate and Barrel one season, but I haven't put them up for many years now. Maybe they'll make another appearance next year. It's that time of year again. Nothing says winter holidays like a bowl of juicy clémentines from the Mediterranean basin. I enjoy them every season. Two or three make a good dessert or evening snack. 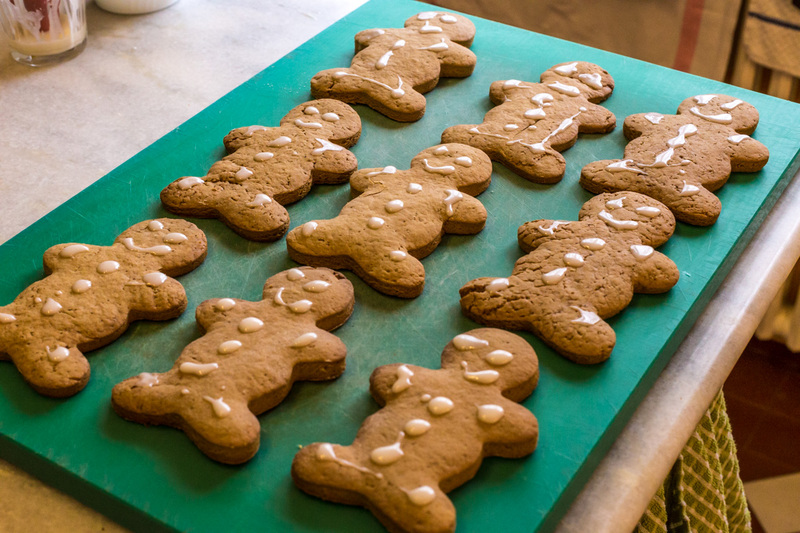 Of course, we're still working on finishing that batch of gingerbread men. These clémentines are from Corsica, often sold with leaves attached. The other major sources are Morocco and Spain, usually sold without leaves. 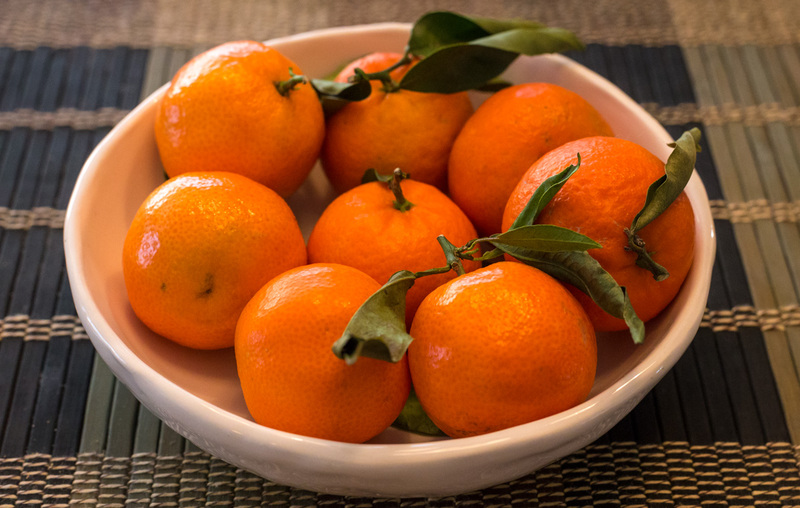 Clémentines are apparently a cross between mandarines and another variety of orange. They're named for an Algerian monk, Brother Clément, who bred them in the late 19th century. There's also the tangerine, named for the Moroccan city of Tangiers. The differences among these fruits are subtle, and I suspect that French people use the word clémentine as a general category for all of them, although I do see the different varieties marked accordingly in the supermarkets. I'm planning to put up the holiday tree today. The weather wizards are predicting snow and freezing rain starting later this morning, so we have no plans to leave the house except to take Tasha out for her walks. They may be short walks. We see a lot of these around us during the fall and winter. They're there in summer, too, but they're more easily recognized (at least by me) after the leaves and flowers are gone. 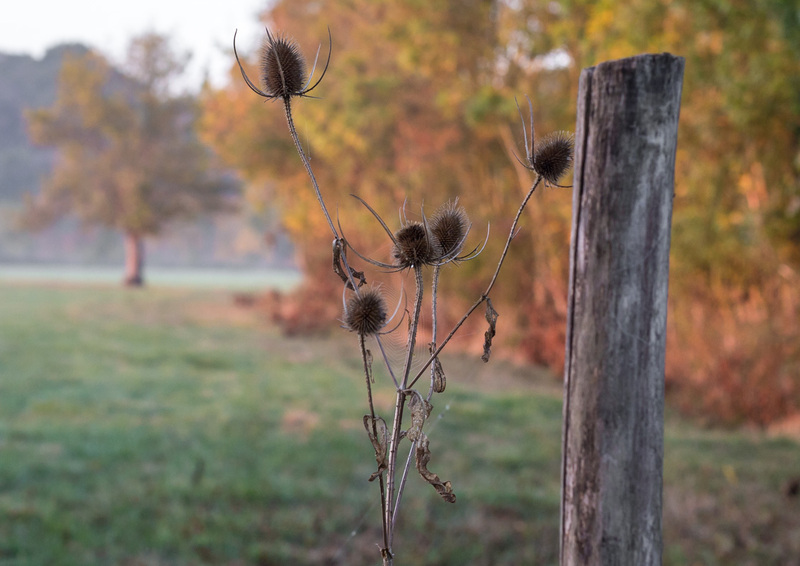 Teasel is the English word for these cardères (dipsacus fullonum). I read that they are considered invasive plants in the US, but I don't remember seeing them there. It's time to separate the men from the boys. 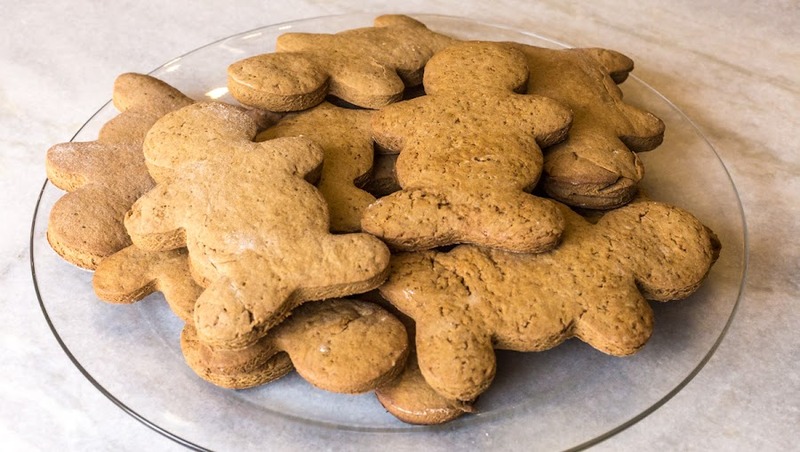 The gingerbread boys, that is. A long time ago, I got myself a gingerbread man cookie cutter. I think I made gingerbread men once. Now I've made them twice. 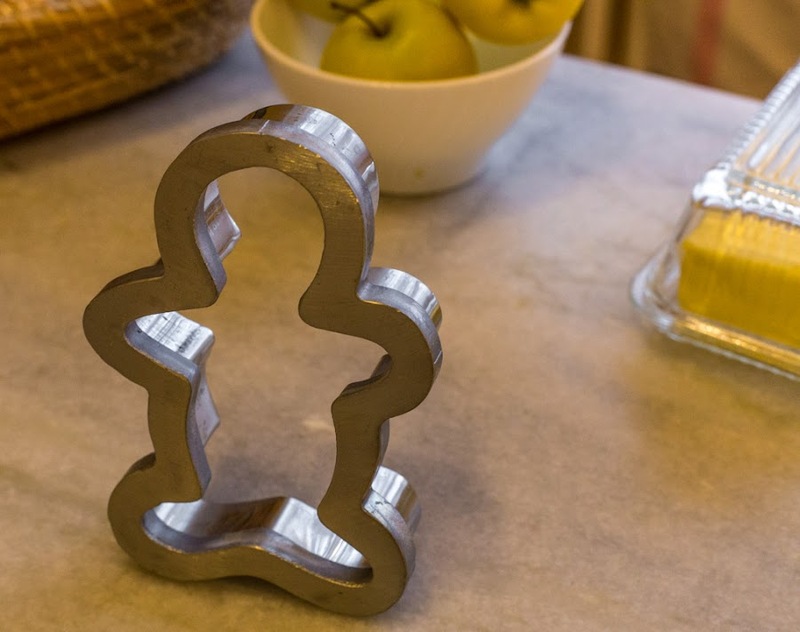 This is the gingerbread man cookie cutter. It wasn't difficult. The dough was a little hard to work with. The recipe said to chill it overnight, which I did. But it was too stiff and my rolling pin made a mess of it. But I got through, and managed to make a bunch of cookies. They baked well enough and looked delicious. Then I tried to decorate them. The icing recipe I used made a very wet mixture. It dripped and ran everywhere. The poor gingerbread men started to look like gingerbread zombies. Oh well. They still tasted good. Brains and all. I will try another recipe the next time, especially for the icing. This is what the house looks like this holiday season. It's different from previous years because I didn't string the lights all the way across the front. I've decided that I'm getting too old to climb up two stories on an extension ladder to hang lights. I can do it, but one false move and I'd likely fall and break my neck. Better safe than sorry. Some time between 07h30 and 08h00 on Tuesday morning. Hanging the lights above the deck section is easy because I can use a step-ladder up there. It's much more sturdy and there's less chance of falling. I won't win any holiday decoration prizes, but they don't give those out here, so I'm not going to miss anything. ...it felt like fall. Now, the trees are bare and it's feeling more like winter. Temperatures are dropping lower each day. The weather people predict that the lows will dip below freezing as the week goes on. I'm back to making daily fires in the wood stove after a couple weeks of relative warmth. These are the shortest days, these weeks around the winter solstice. We'll only have just over eight hours of daylight today, and nearly sixteen hours of darkness. A little fall color in our back yard, just over a month ago. The growers have begun pruning their vines out in the vineyards. They will continue through the winter until all the vines have been cut back to a single cane, ready for spring growth. The holiday season is in full swing. Stores and markets are stocked with turkeys and foie gras and boxes of fancy chocolates. Local firefighters are making the rounds selling calendars for their annual fundraising drive. Jehovah's Witnesses are making the rounds searching for souls in their annual exercise in futility. The usual charities are collecting food, clothing, and funds to help those in need. And school kids are looking forward to two weeks off as the end-of-the-year vacations approach. Winter arrives officially in ten days, but it feels like it's already here. Not long ago, it felt like fall. Little ball of fire. Bert likes to be warm. He sits on the radiator behind the couch when it's on. And he climbs into the fireplace to sit next to the hot wood stove until it gets too hot. Yesterday, I found him curled up on the log carrier in front of the fire. Bert snoozes in front of the fire. He spends his nights outdoors (hunting) and in the garage and utility room on the ground floor. He has a nice warm bed to sink into, and there's a laundry basket lined with towels that he sometimes curls up in. But he certainly enjoys a little fire time in the cool season. At Saturday's market, I bought some cockles. 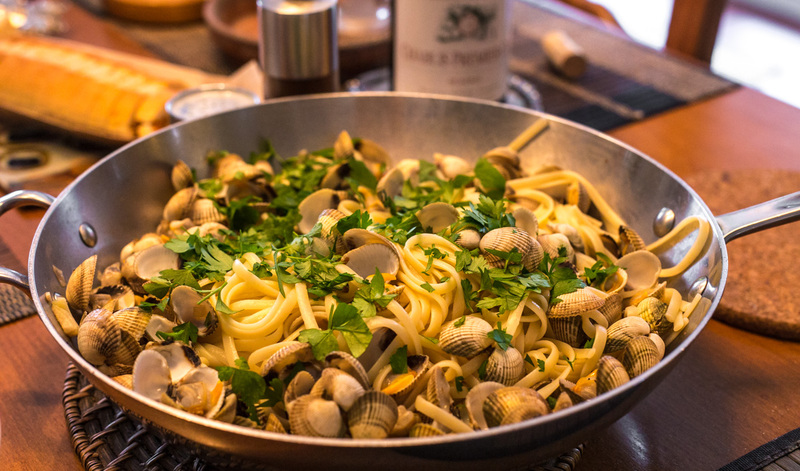 They're small clam-like shellfish that we use to make the famous pasta dish: linguini with white clam sauce. It's a favorite dish of mine and it's so easy to make. The coques (cockles) are sold by the fish monger at the Saturday market in Saint-Aignan. Linguini with white clam, or in this case cockle, sauce. Served with a chilled Chablis. I got a kilo's worth for 12 euros. Ken prepared a salt bath with cornmeal so the cockles would purge themselves of any sand or grit, and we set them out on the (cold) deck for a few hours. Then we cooked some linguini, made a sauce with garlic, shallots, and white wine and cooked the cockles in it. We served it all in the pan with fresh chopped parsley. Yum! This is another view of the church of Saint-André in Niort. And the last, at least for now. 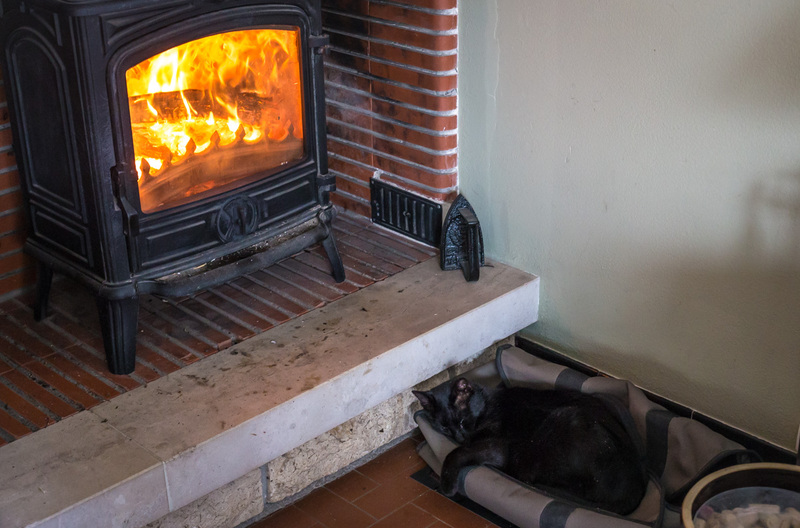 As a recap, Ken and I spent a week in a rental house in the Vendée on the mid-Atlantic coast of France back in late October. 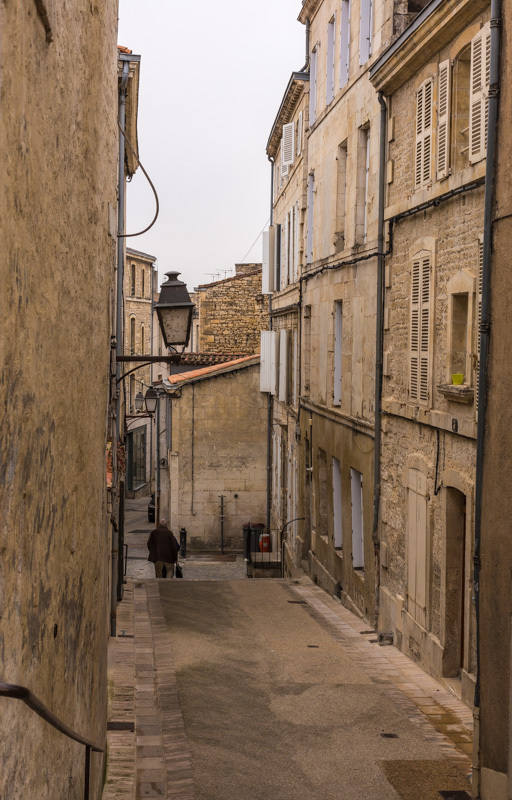 We made day trips to the coastal city of La Rochelle and to the island of Noirmoutier, and spent a morning wandering around the city of Niort. We also did a lot of shorter trips in the Marais Poitevin, closer to the rental house. 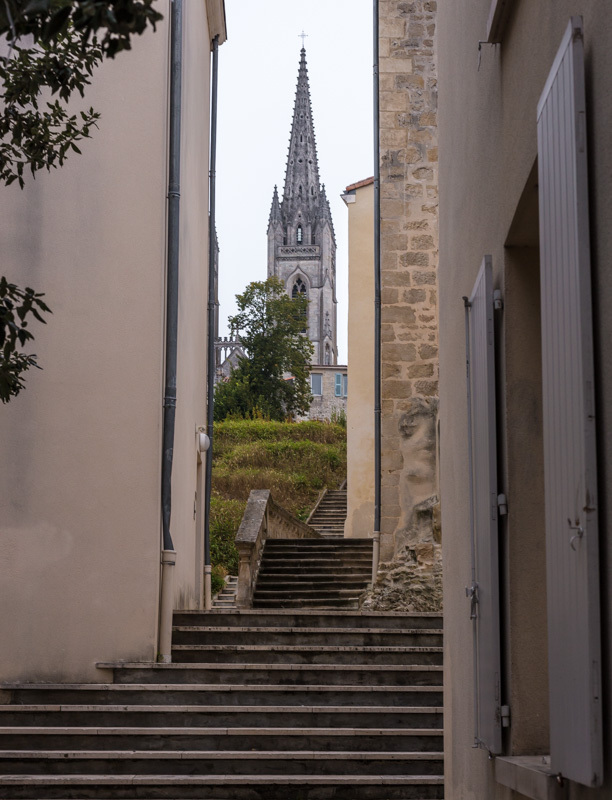 The church seen from down below as we prepared to leave Niort. I've been posting photos from that trip for a while, but now it's done. What's next? Who's to say. Probably some views of fall from last month, although winter is now almost upon us. And so are the holidays. We have several special meals to look forward to and prepare, and there will likely be photos of those, as usual. Stay tuned! This is a city cat. 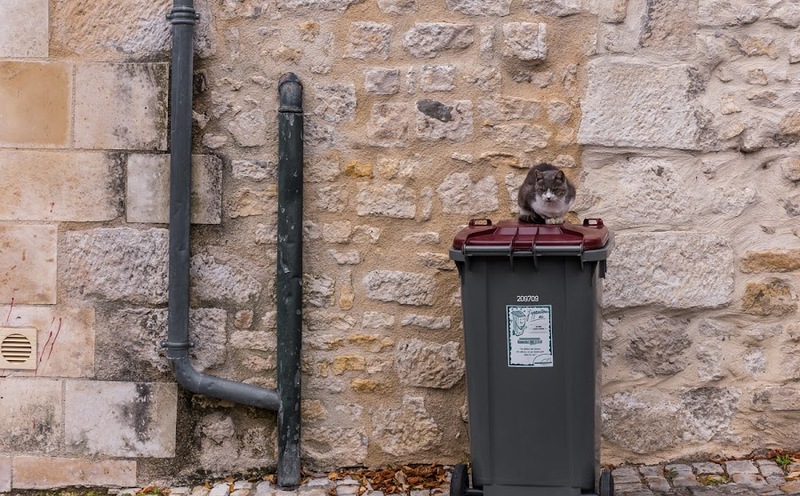 He's perched on a garbage can, able to see all the action on his street and remain safely above the fray. I'm not sure that Tasha noticed him, even when I stopped to take the picture. But the cat was keenly aware of us. His cool stare didn't fool me. The cat is staring right at Tasha, I'm sure of it. Bert's a country cat. But I'm not sure there's much of a difference. He does exactly the same thing, although his perch is often the roof of the car. 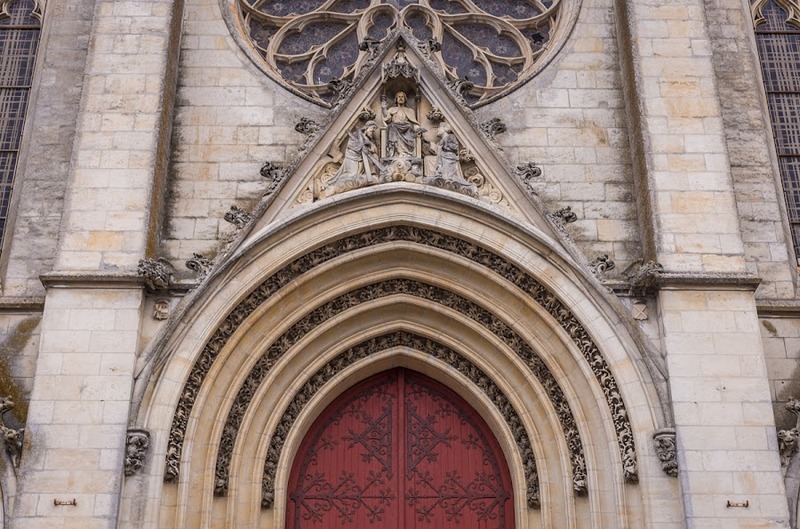 This is a partial view of the entrance to the church of Saint-André in Niort. I had the 50mm fixed lens on the camera, which means that I would have had to get some distance away from the doors to get them all in the frame, and there wasn't that much distance available. I've been shopping for a good quality zoom lens in the 20-70mm range, but I'm not prepared to pay the prices I've seen for one. This is the largest of the three red doors into the church. The iron work, not to mention the stone carving, is amazing. So, my options are limited to "sneaker zoom," or physically changing lenses (I have a 24mm wide-angle) while out on foot. That's normally not much of a problem because I can carry the extra lens on my belt, but I had Tasha attached to my waist on this occasion and the wide lens stayed in the car. 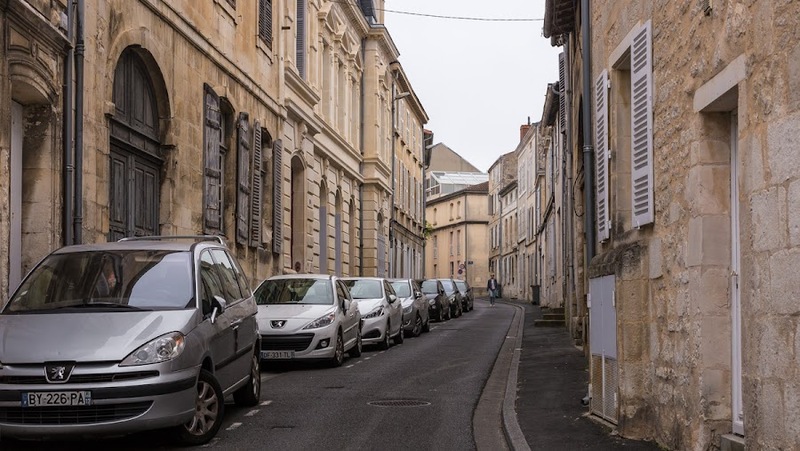 Another street scene in Niort. I'm running out now. Really. A guy heads down into town. I'm beginning to think about the holidays. I may have a dry day soon to get the lights up on the house. The tree won't be put up until the 15th. I'm going to the Saturday market this weekend to see what their schedule is for Christmas and when to order the holiday bird. We've decided on a chapon de pintade (guinea fowl capon) for this year. 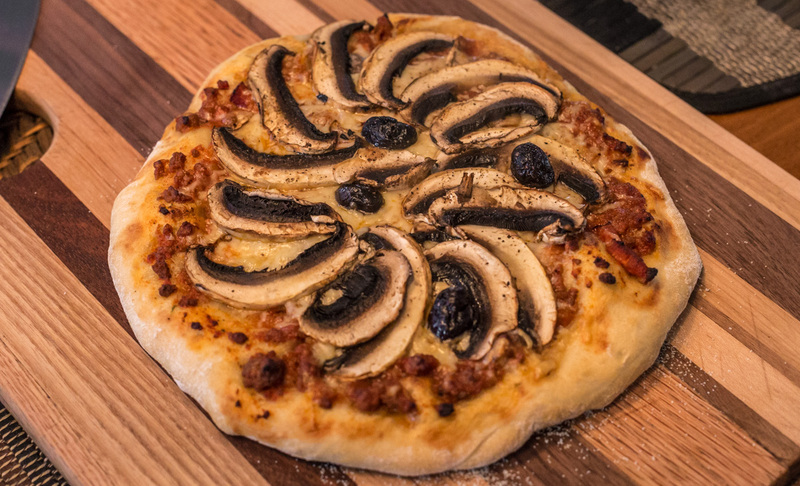 We had a couple of large stuffing mushrooms and some Bolognese sauce leftover in the refrigerator, so we decided to make pizza. I started out on Sunday evening making the dough. I use a no-knead recipe that rises for eighteen hours. If I start the dough at 18h00, it's ready to be used by noon the next day. The first of two mushroom pizzas with our home-made Bolognese sauce for Monday's lunch. The recipe makes enough dough for two individual pizzas. We share one, then take a break while the second one cooks. I rolled out the dough, spooned a little sauce on and spread it almost to the edges, then I sprinkled grated cheese on the sauce. I topped the pie with one of the large mushrooms, thinly sliced, a few black olives, and some salt and pepper before sliding it onto the pre-heated pizza stone in a hot oven. Et voilà ! Eat, rinse (with wine), and repeat. 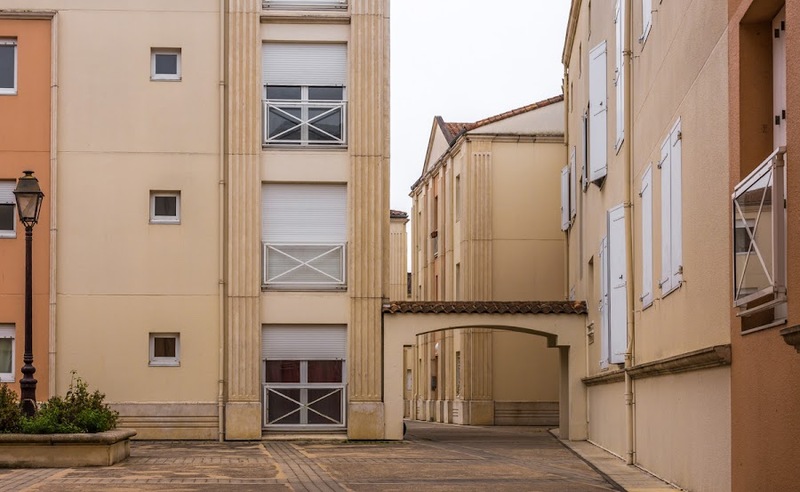 Here are a few relatively modern residential buildings in the heart of old Niort. We passed by as we wound our way around the neighborhood near the church of Saint-André. I wonder what was there before these buildings. Vacant land? Crumbling houses? An empty warehouse? Certainly what's there now is in better shape than what it replaced. The doric pilasters add a nice classical touch. I'm almost done with the photos from this trip we took back in October. Then what? I haven't taken the camera out in a while. It's often too dark and overcast or raining when I take the dog out for walks this time of year. Not much fun for photography. We'll see what happens. This is the Eglise Saint-André in Niort. The building is not very old, built in the second half of the 19th century, but a church has stood on this hill in the city since the 12th century. As we walked around town, we caught glimpses, like this one, of the church's spires at almost every turn. 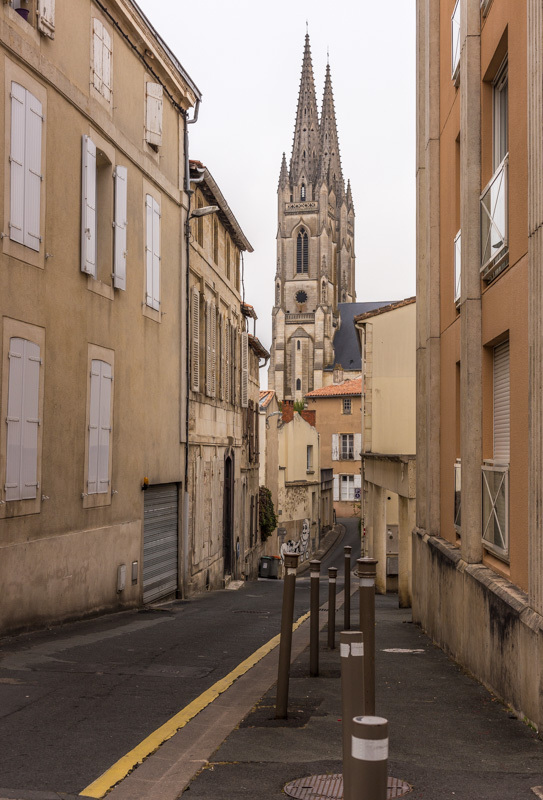 The church's towers framed by buildings on the rue Vieille Rose. A closer look at this photo reveals a surprising piece of street art. As often happens, I didn't notice it when I took the picture, but later (like yesterday), when I zoomed in using the computer. I thought it looked like a person in the distance, but it turns out to be art. Had I realized it while there, I might have walked by for a closer look. 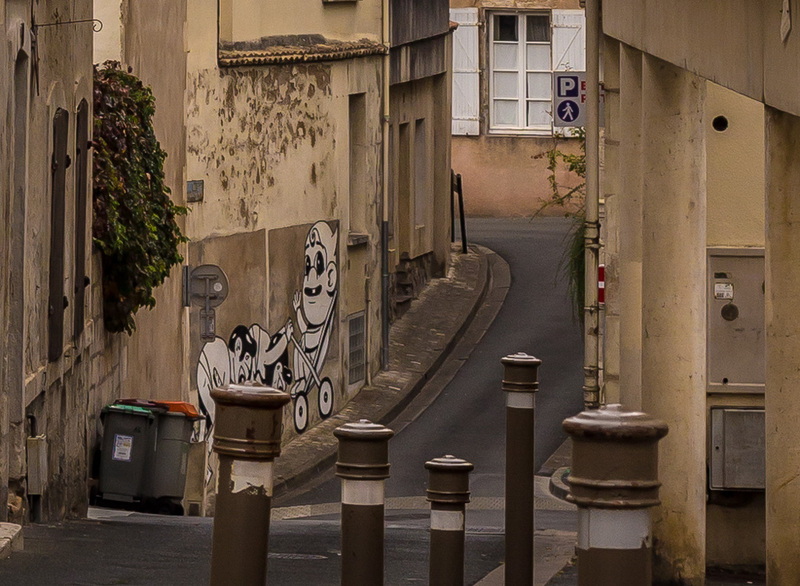 Street art in Niort. I wish I had got closer. As I said, both of these images are from the same photo. I'm not sure which version I like better. It's as if the people in this neighborhood bought cars to match their shutters. Or at least not to clash with them. It's all very neat and clean looking. We're expecting it to start raining again around noon today. It's predicted to be a very wet, but warm, weekend. And Monday doesn't look much better.